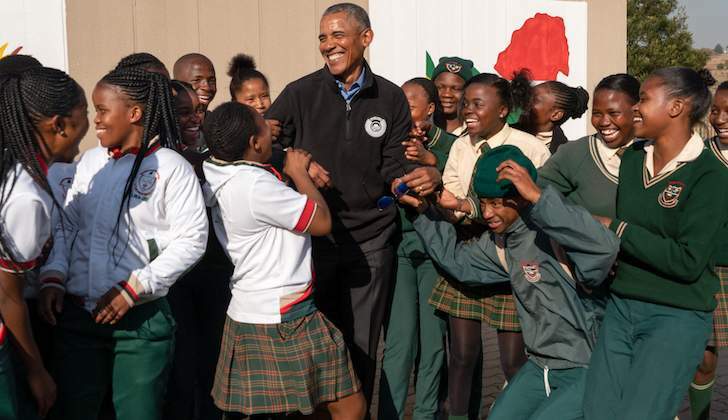 President Obama greets students at Far North Secondary School during a service project to commemorate Mandela Day with Obama Foundation Leaders in Johannesburg. JOHANNESBURG, SOUTH AFRICA – On 18 July the Obama Foundation concluded its Leaders: Africa gathering of 200 rising leaders from 44 countries with a Town Hall with President Obama. During the Town Hall, President Obama heard from the Leaders about their work and challenged them to be the change they want to see, echoing the gathering motto of "we are the ones we've been waiting for." The convening is part of a one-year leadership development and civic engagement programme designed to train, support, and connect emerging African leaders to create positive change in their communities. The convening included plenary sessions, problem-solving workshops, leadership sessions, and skillbuilding trainings to increase the Leaders' capacity to drive positive change in Africa. "I could not be prouder of what you've already accomplished, but when we get all of you together in one room... the whole is greater than the sum of its parts," said President Obama. "It's giving us some small sense right now of the remarkable transformations that, collectively, you are going to be able to make manifest in this continent and beyond.So let's get to work." After the Town Hall, President Obama and the Leaders participated in a group service project to honor Nelson Mandela on the 100th anniversary of his birth and to underscore the important relationship between leadership and service. The Leaders went to the Far North Secondary School in Johannesburg and painted a mural, made benches for students, beautified the campus grounds, and cleaned windows. Video of the Town Hall with President Obama, the plenary session on "Innovating for the Next Generation," with speakers Aliko Dangote, John Collison, Trevor Manuel, and Eleni Giokos, and other content from the gathering can be found below and on obama.org/africa.